Conditions at Poker Flat Research Range weren’t indicative of a possible launch on the evening of Feb. 6, 2013. The skies were cloudy and the aurora wasn’t out, but then, a camera stationed downrange at Kaktovik, Alaska showed some promising aurora. From there, everything lined up to create the perfect conditions for the VISIONS sounding rocket to launch. 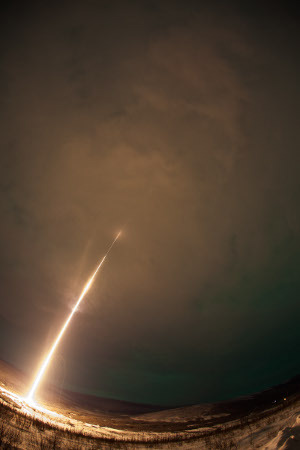 At 11:21 p.m. Alaska Standard Time, the four-stage rocket began its 16-minute flight into the upper reaches of the atmosphere where it flew through an auroral substorm before impacting in the Arctic Ocean. VISIONS, short for “VISualizing Ion Outflow via Neutral atom imaging during a Substorm,” is a NASA mission aimed to understand how the aurora heats and slingshots oxygen out of the upper atmosphere. Douglas Rowland, of the Space Weather Laboratory at NASA Goddard Space Flight Center, was the principal investigator for the project. Rowland said the rocket performed well and all four of the onboard instruments executed their jobs as planned, collecting data in a myriad of ways. Initial results look positive. With the rocket launched, scientists will begin the next phase of this project – crunching the copious amount of data. Part of the data analysis will compare information collected during the rocket’s flight with ground-based data, gathered at sites downrange maintained by faculty from the Geophysical Institute and Poker Flat Research Range personnel. Those downrange cameras will allow Rowland and his team to pick just a portion of the rocket’s flight, and examine it in extreme detail. The 2013 launch of VISIONS was the first to be covered in real-time by social media at Poker Flat. Range personnel established a helpful Twitter feed and constant updates on its website that allowed scientists and others interested in the project worldwide to stay up-to-date as the range prepared for and ultimately launched the sounding rocket. Rocket launches from Poker Flat aren’t slated for specific times or dates, they may occur at any time during a prescribed window if scientific conditions are right. Therefore, planning to see a launch is difficult for those not affiliated with the range. This unprecedented access to launch season activity is a boon to rocket enthusiasts and aurora buffs hoping to capture site of a launch into the aurora. VISIONS was the only rocket scheduled for the 2013 launch season.